Do the religious affiliations of elected officials shape the way they vote on such key issues as abortion, homosexuality, defense spending, taxes, and welfare spending? 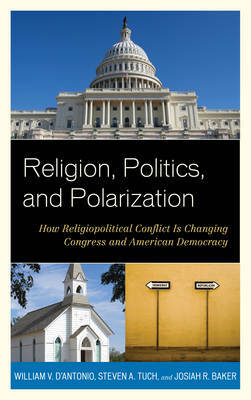 In Religion, Politics, and Polarization: How Religiopolitical Conflict is Changing Congress and American Democracy, William D'Antonio, Steven A. Tuch and Josiah R. Baker trace the influence of religion and party in the U.S. Congress over time. For almost four decades these key issues have competed for public attention with health care, war, terrorism, and the growing inequity between the incomes of the middle classes and those of corporate America. The authors examine several contemporary issues and trace the increasing polarization in Congress. They examine whether abortion, defense and welfare spending, and taxes are uniquely polarizing or, rather, models of a more general pattern of increasing ideological division in the U.S. Congress. By examining the impact of religion on these key issues the authors effectively address the question of how the various religious denominations have shaped the House and Senate. Throughout the book they draw on key roll call votes, survey data, and extensive background research to argue that the political ideologies of both parties have become grounded in distinctive religious visions of the good society, in turn influencing the voting patterns of elected officials.